About the book: It's time to take the battle to the dragons. 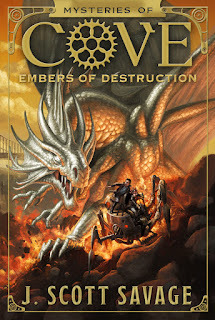 In the third and final volume of the bestselling Mysteries of Cove series, Trenton and Kallista—along with their friends, Plucky, Simoni, Angus, and Clyde—fly their mechanical dragons south toward San Francisco, looking to rescue any survivors from the battle of Seattle. Arriving in San Francisco and investigating the area in secret, the young riders are reunited with Kallista's father, Leo Babbage, who reveals that the humans in the city are working as slaves to the dragons, but that they don't want to be rescued—himself included. He says they are being protected by their new master: a huge, powerful white dragon who lives in an impenetrable tower fortress overlooking the city. Kallista is stunned by the news. Why would her father ever willingly want to work for dragons? 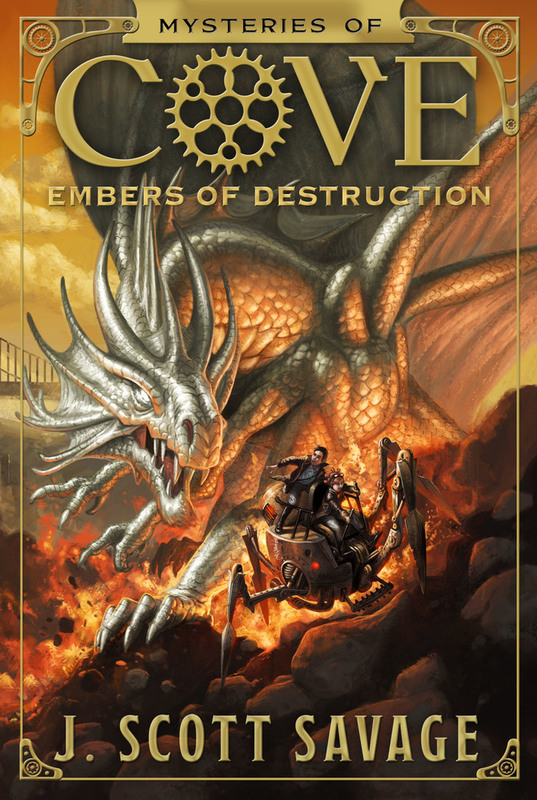 Trenton and his friends are confronted by the guards and their mechanical dragons are seized. Evading capture, the young riders escape and begin looking for a way to break the white dragon's hold over the city—and over Leo. Working with the kids from the city, the young riders track down the source of the dragon's power to an underground chamber that is accessible only through an underwater passageway below the tower fortress. With the white dragon watching their every move, Trenton and Kallista will need every bit of creativity and ingenuity they can manage to find a way to retrieve their stolen dragons, enter the tower fortress, and take down the dragons once and for all. My review: I'm so sad to see this series end. I've loved reading about Kallista, Trenton, their friends and their adventures. This is an amazing end to the series and really ends the series with a bang! When last we saw our friends, they'd just discovered that Seattle had been ransacked by the dragons and no one was left, including Kallista's dad Leo. Unsure of just where to begin, the kids are trying to find Leo and figure out just where the dragons come from. I love that this book switches back and forth between Trenton's view and Kallista's view. That way you can know just what each of them see and know. Between the two of them, they give a pretty great picture of what's going on everywhere all the time. Throughout the series, we've gotten to know the two characters and I really like both of them. Not that they don't both have flaws, they do, and I like that they do, just like real people. I like the way this book kind of puts the kids in charge, there's something up with the adults in this book and the kids are able to see things and situations with the dragons clearer than the adults do. The plot of this one is full of twists and turns, adventures and traitorous actions by many different people. It really kept me guessing and I loved every second of it. I didn't want to put it down. I know that this book will be well loved by all, by the audience of middle grade readers that it was written for, but by adults as well. It really is just amazing! Make sure you've read the first two books in the series, this one won't make a lot of sense unless you know what's happened in the others! About the author: J Scott Savage is the author of the Farworld middle grade fantasy series and the Case File 13 middle grade monster series. He has been writing and publishing books for over ten years. He has visited over 400 elementary schools, dozens of writers conferences, and taught many writing classes. He has four children and lives with his wife Jennifer and their Border Collie, Pepper in a windy valley of the Rocky Mountains.